unfortunately our .desktop translations with gettext patch does not work for notifyrc files (although the gettext domain happens to get added during the build). So translations for kubuntu-notification-helper notificationhelper.notifyrc need to be merged into the file from Launchpad. We don't use the text from the .notifyrc file at all. It all gets overridden by i18n'd strings when the notifications are called. The text is just there because text has to be there. I'm not sure what importance to give this for the translations task. How visible are these strings? 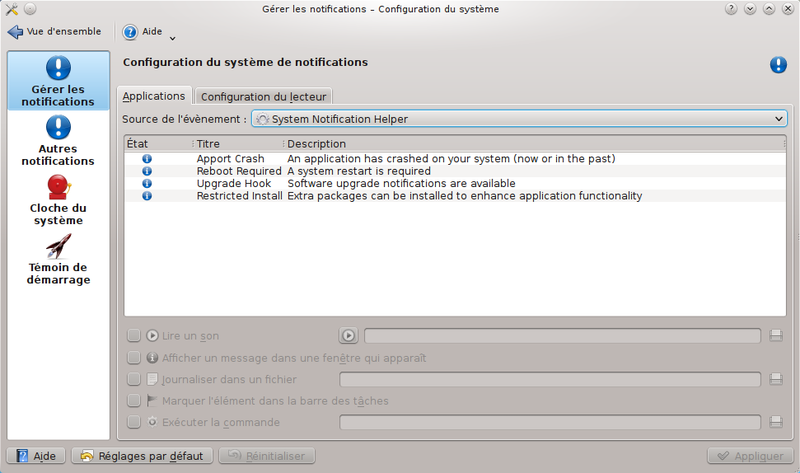 Do now all notifications appear untranslated in Kubuntu? Minor visiblity I would say. While they *are* visible, one almost has to look for them... In systemsettings -> notifications foo -> notifications -> in the drop down select system notification helper. What's more, technically they might appear in the pot BUT I am not entirely sure if the translated strings get fed back into the system (KDE expecting translations within a desktop file and all, while notifyrcs are not necessarily handled like regular desktop files which might be a bit of a problem here). @JT: why are we not using those strings btw? Thanks for the clarification, Harald. Setting the importance accordingly. OK, however the translations catalogue isn't being loaded. hmm, running in Spanish I do get translations. Most confused.